More travels through packrat-ism. In about 1994 I worked with a _very_ diverse staff of Respiratory Therapists. 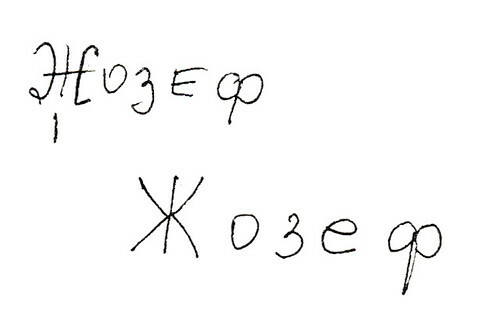 One of the women was a Russian, and I prevailed upon her to write my name, “Joseph” in Cyrillic. It looks pretty cool. And now that I’ve scanned it, I’ve one less piece of paper! Yay for trimming and slimming. Albeit one page at a time. Joe Crawford blogged this at 10:03am in 2005 in August. The 30th was a Tuesday. You are reading this 14 years later. Comment. There are no comments Tweet. Send email. It has hashtags→ memories .